The Hi-Way® XT3 Type I Multi-Purpose Dump Body spreads deicing materials at the rear or front with the optional front cross conveyor. The flat dump body floor allows hauling of virtually anything, including pallets and barrels. It also dumps with a front telescopic hoist that provides a low center of gravity and eliminates the need for a sub-frame. Standard features on the XT3 Type I include heavy-duty 7-gauge 409 stainless steel inner and outer longitudinal sills, fully welded to body floor to resist corrosion and improved strength; 7-gauge grade 50 body sides with one-piece construction with radius design to reduce material build-up and a 3/16” (4.8mm) AR400 conveyor floor, which resists bending from load impact and provides superior wear resistance. The Hi-Way® XT3 Type II Front Discharge Multi-Purpose Dump Body broadcasts deicing material in the front of the drive tires for better traction and safety. The flat dump body floor allows hauling of virtually anything, including pallets and barrels, and the front telescopic hoist provides a low center of gravity and eliminates the need for a sub-frame. Standard features on the XT3 Type II include heavy-duty 7-gauge 409 stainless steel inner and outer longitudinal sills, fully welded to body floor to resist corrosion and improved strength; 7-gauge grade 50 body sides with one-piece construction with radius design to reduce material build-up; and a 3/16” (4.8mm) AR400 conveyor floor, which resists bending from load impact and provides superior wear resistance. 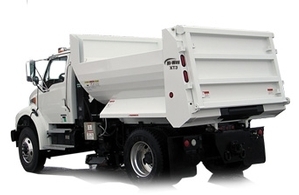 The Hi-Way® XT3 Type III Multi-Purpose Dump Body spreads deicing materials at the rear of the box. 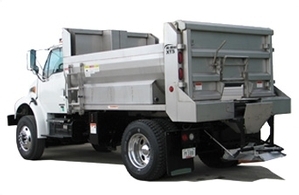 The flat dump body floor allows hauling of virtually anything, including pallets and barrels. It also dumps with a front telescopic hoist that provides a low center of gravity and eliminates the need for a sub-frame. 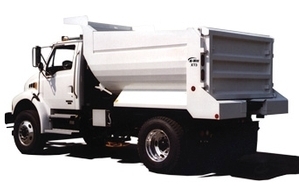 Standard features on the XT3 Type III include heavy-duty 7-gauge 409 stainless steel inner and outer longitudinal sills, fully welded to body floor to resist corrosion and improved strength; 7-gauge grade 50 body sides with one-piece construction with radius design to reduce material build-up and a 3/16” (4.8mm) AR400 conveyor floor, which resists bending from load impact and provides superior wear resistance.